A Midlands restaurant has been fined more than £9,000 after fat and oil poured down a drain blocked a sewer and caused a waterway to become polluted. The restaurant in Shropshire, was prosecuted by the local water company, in only the third case of its kind to be brought in the UK. 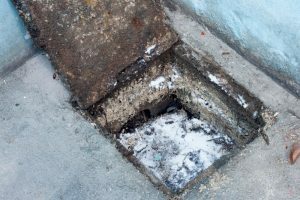 In Court, the restaurant pleaded guilty to pouring fat into the sewer causing interference with the flow and was fined over £9000. Severn Trent Water said the fat used for cooking caused a huge blockage, resulting in the sewer overflowing into a local watercourse. Several letters had been sent to the business but were ignored. The letters advised that the installation of a grease trap would minimize the problem. From time to time, we’d like to update you with news and offers from Cowan Catering Management. Please tick if you agree to receive these emails. Please note, we will never share your details with any third party.